Clearly, a typical consultant’s day at McKinsey consists of many hours of work and long evenings: tjis is the reality of McKinsey job. That said, the opportunities offered by McKinsey are largely outside the scope of the office. I chose two videos to illustrate life at McKinsey, in two offices that some people might consider opposites: London first, and then McKinsey in Lagos. This great diversity of work context leaves a place for a common culture which is reflected in these two short films. At McKinsey, it is also possible to work on projects pro bono for NGOs, international donors, and then to be transferred from one office to another anywhere on the entire planet. Enjoy excellent training seminars, as well as training by peers in terms of personal development. The “global” approach of the firm here is key. This means that membership in a particular office will not prevent the staffing of a consultant in a distant office: the company reasons globally, and it is the profile most suitable to the needs of the customer who will be retained, without arbitration by location. 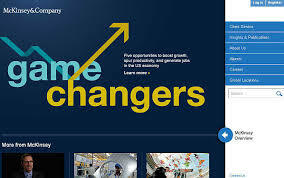 Of course McKinsey is not the most original cabinet, but its mode of operations allows its consultants to evolve in a particularly rich environment and gives them the feeling of having the world at hand. The fun camaraderie and the playful spirit are not in the DNA of McKinsey. Once again, no judgment of value here: some candidates will be perfectly comfortable using this extreme formalized framework; there is no shame in this. Personally, I was planning on a softer framework. It is what led me to reject the offer I received from McKinsey. It is imperative to make your informed opinion because after the emotion of the contract signature, the culture of the firm will be a key parameter impacting your daily life, which will accompany you in continuous mode. I’ve seen too many consultants be mistaken on this pane, which can result in early discouragements in this business. In McKinsey, everything is clear: culture leaves no place for ambiguity or improvisation. The world will be at your door, but in the proper sense of the term, so you must be willing to go where “the firm” will most need you, even if it is on the other side of the planet. At McKinsey, it really is the “one firm” that prevails on the optimizations budgetary inter-office. The pace of work is not known to be particularly higher than in the two other of the three top firms. As always, the type of assignments, clients, and partner will influence your workload and your social life at least as much as the culture of the firm itself. I wish for you to be able to make the choice to accept or refuse this type of offer in a very short time!